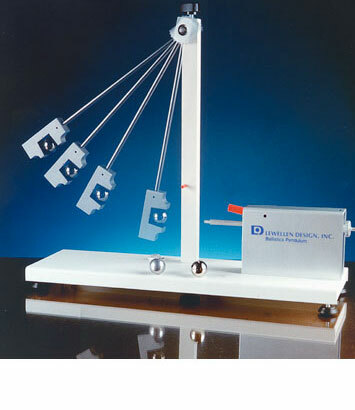 Advanced Ballistic Pendulum Apparatus | Archimedes’ Ark | Lewellen Design, Inc.
Lewellen Design, Inc. has been the only manufacturer of this Ballistic Pendulum since 1990. We are now able to sell directly without a catalog markup! They are all new and identical to those sold in the catalog as Lewellen Design CP87000-00. This is a ballistic pendulum apparatus, a second law of motion and also projectile gun for trajectory experiments all in one apparatus. The projectile gun propels a 1″ ball into a wedged-shaped receiver on the pendulum bob. A precision roller clutch with needle bearings at the pivot point holds the pendulum at the peak of its swing, allowing measurement of the height and angle of the swing. The pendulum target can easily be moved entirely out of the way when using the projectile gun for trajectory experiments. The spring-powered projectile gun has an infinite variety of velocities. The shaft of the projectile gun is double-ended, enabling it to be used as a second law of motion apparatus when used with two balls. Easy setup is provided with a built-in bulls-eye level and adjustable feet. It comes with two drilled steel and one aluminum 1″ balls and complete instructions. Archimedes’ Ark apparatus permits students to see the results of tests on Archimedes’ Principle in real time. By seeing the actual water displaced by a floating object and being able to weigh it, and compare that weight with the weight of the object, the principle becomes evident. For items which sink, the amount of water displaced indicates the item’s actual volume. This realization by Archimedes led him to proclaim “Eureka!, or “I have found it!” when trying to determine the physical volume of a crown. It also determines the amount of buoyancy of the object which sinks. After weighing the water displaced, use the balance beam provided and hook the object tested to it and add weight to the tray until the beam becomes horizontal. The weight in the tray plus the weight of the displaced water will indicate the weight of the object tested within experimental error. This visualization permits students to understand the concept clearly. You may conduct a straight forward experiment with Archimedes’ Ark or use equations in conjunction with the investigation for a quantitative approach to proving Archimedes’ Principle. A brass tube, 48″ L and 1/4″ in diameter, has a machined groove near one end that seats on a vertical support tailstock. This stabilizes the tube and acts as a stop, allowing expansion to take place in a single linear direction. The other end rests on a horizontal section of a pointer rod which is mounted on a set of rollers. Steam is blown through the inside of the tube (Steam generator required, but not supplied). The expansion of the heated tube rotates the pointer rod, allowing the user to measure the co-efficient of expansion of the metal tube. This unique design utilizes an offset-weighted shaft on a DC motor. When the motor is in operation, waves are generated along the attached string. String tension is controlled either by hand, or with the use of weights (not included) and a table-mounted pulley (not included). The voltage is altered to change the wave pattern. The base is specifically designed to provide a clamping surface, allowing either right or left handed operation. Two binding posts provide a location to connect a 0-6 VDC power supply.